The Day of the Meeting was sent incorrectly from Tri-County it will be on March 4th, 2018 not the 7th. Tri-County Community Action, Inc. will hold a Board Meeting on Monday March 4, 2019 in Center, Texas. The meeting will be held at the Central Office located (214 Nacogdoches St.) Center, Texas. The meeting will begin at 6:30pm. For more information call (936)598-6315 ext:201. The Shelby County Chamber of Commerce Ambassadors along with Tiffanne Klein, owner of Dazzle Me Pink & Blue, will welcome Chamber members to a Business After Hours event on Tuesday, March 12th , from 5:00 until 6:30pm. Dazzle Me Pink & Blue will showcase the beautiful collection of children’s clothes and accessories, while at the same time Chamber members will have an opportunity to network with each other in a casual and relaxed atmosphere. Dazzle Me Pink & Blue is a lovely Children’s Clothing Boutique with children’s clothes ranging from newborn to 16 years. Tiffanne and her staff will be more than happy to help pick the perfect outfit and/or gift. They offer baby registry, lay away and monograming. Spring and Easter are right around the corner so start shopping for cute new spring items and the perfect Easter outfits for your children. Dazzle Me Pink & Blue is located at 902 Tenaha Street. 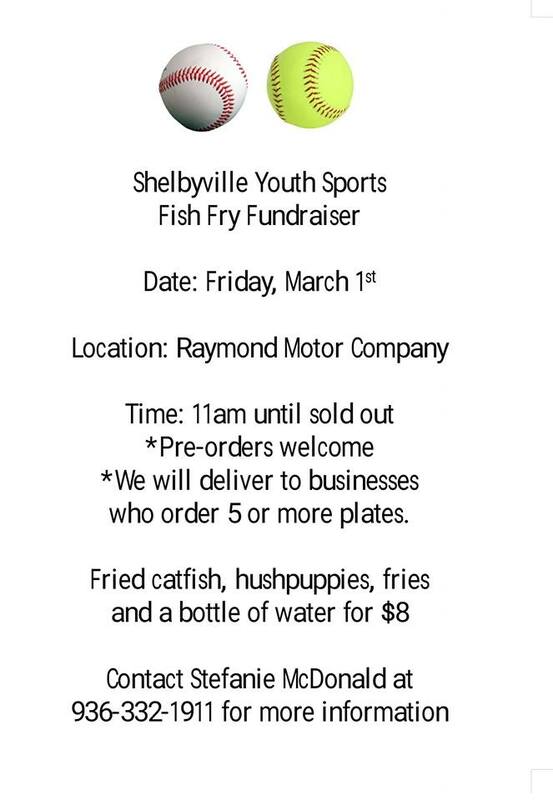 For more information please contact the Chamber at 936-598-3682 or visit info@shelbycountychamber.com. The JV Baseball tournament in Central has been canceled. All of us here at Shelby County Outreach Ministries, Inc. would like to extend our greatest appreciation to everyone involved in our Steel Building Fundraiser. For those who helped get it together, sell tickets, and bought tickets, we couldn’t have done it without you! We are humbled by all the support we get from our wonderful community. We would like to thank General Shelters for working with us on this fundraiser. We are gracious and hope to collaborate with you in the future. We would also like to extend our gratitude to the Fundraiser Committee here at Shelby County Outreach Ministries, Inc. for taking time out of their busy schedule and helping out in various ways. We want to acknowledge one individual in particular for all the hard work and dedication he has put into each of our fundraisers and that is Mr. Sammy Arnold. We are blessed to have him and each of the members of the Committee. The winner of the Steel Building was James Blue. Congratulations to Mr. Blue and thank you for purchasing a ticket from us! Enjoy the building. March is Texas History Month so in place of the regular March meeting of the DRT, they are inviting the public to join them at noon on Friday, March 1, by the DRT building on the Courthouse Square in Center. They will pay tribute to Texas Independence Day, Texas Flag Day, the birthday of Sam Houston and the heroes of the Alamo and Goliad. We'll tell you about some of the women and children who survived the battle of the Alamo, and they will recognize one of their Chapter members, Juanita Sample Chandler, as a Real Granddaughter of the Republic of Texas. Her grandfather, James Bedford Sample, was a resident of what became Shelby County during the days of the Republic of Texas. Come celebrate some of our Texas history. In case of rain, they will meet in the Historic Shelby County Courthouse on the Courthouse Square. The Center First Baptist Church is having a brief meeting Wednesday night 6 p.m. at the First Baptist fellowship hall. The focus will be on supporting parents and children. Please spread the word. The First Baptist Church in Center will have luncheons for their revival will be Monday through Wednesday next week at 12 noon. 30th Annual Texas Blueberry Festival will be on June 8, 2019, in downtown Nacogdoches! The annual cemetery cleaning for the mt Gillion cemetery will be held on Saturday, March 9, 2019, from 9 a.m. until 1 p.m.
All that have loved ones that are laid to rest there are asked to bring your lawn tools mowers, blowers weedeaters etc. for this important task. The past two years have been a great success. They look forward to seeing you there. 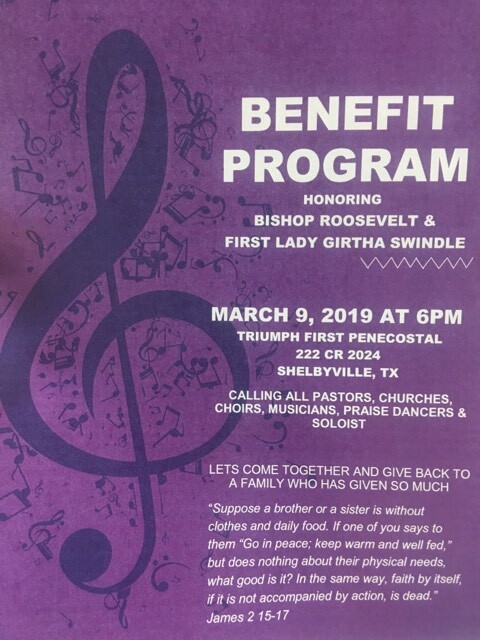 For more information, please contact Terran Watts 936-332-0720 President, George Grace 936-572-0154 Vice President or Sharon Hamilton, Secretary 936-591-0797. The Joaquin Local Masonic Lodge nominated JISD 1st graders to receive a Dental Health Program with dental kits from the Fantastic Teeth Club. Today February 26, 2019, we had a great dental program. Mr. John Paul Sledge introduced the local masons who attended. Mr. Vance Jordan, Mr. Randy Bonner, Mr. Jerry Agnew and himself. Mr. Sledge talked with the students about good health and mouth care. They were also shown a video about Dental Health Care. Questions were ask after the video and all of our students were great listeners, answering correctly. They would like to give a big Shout Out and Thank You to our Local Masonic Lodge and to the Fantastic Teeth Club. February is Dental Health Month. Tri-County Harvest for Homes will have a produce drop tomorrow Wednesday, Feb. 27, 2019, at the old CVS building at 9 a.m.
Be aware though that the truck may arrive a little earlier or later depending on travel conditions. Learn to eat healthy in order to heal the body!! Several years ago, Dianne was diagnosed with Lymphoma (Cancer). Treatments went well and the cancer went into remission. Dianne also has scoliosis. In January of 2019 Dianne was sent by a doctor to Houston for emergency surgery on her back. A tumor had grown and had her spine bent so badly that the spine cracked. If surgery was not done Dianne would be paralyzed. The Lymphoma had spread and the back doctor had to release Dianne from the back surgery before her doctor could begin treatments on the Cancer. There have been many complications and expenses. Dianne is a member of Providence Missionary Baptist church. They are holding a bake sale on the parking lot of Napa on Friday, March 1, 2019 from 9:00 – 2:00. Benefits and Resale will be taking donations and selling those donations for Dianne on Friday and Saturday, March 1, and 2. Benefits and Resale for area medical expenses is located on Hwy 96N. From Center to Tenaha, one mile on the left. All donations from the Bake sale and the items donated for Dianne will go to Dianne to help with expenses. Contact Regina Danley and Catherine Livingston at (936) 332-0060. Families in the James Antioch Community will have a Garage Sale at the Community Building on Saturday. March 9. 2019 from 8:00 AM to 4:00 PM. Each family will have a table of items for sale. You are invited to come by and see what is on sale. There will be signs to help you find the Community Building but you will need to travel from Center on HWY 7 East about 5 miles to the James Store. There turn right and go on FM 2608 about a quarter of a mile. The Community Building is on the right. We will direct you so you know where to park. If you have questions call Ellen Manning 598-3081. Center, Texas – February 25 – Ash Wednesday is the initiation of the season of Lent. Lent is a spiritual journey spanning 40 days from Ash Wednesday until Holy Saturday before Easter, Resurrection Sunday. During Lent, we are called to a season of self-reflection, some form of spiritual commitment, and special attention to scripture and repentance. For many, it is also a season in which we adopt various acts of kindness and compassion. At Center First United Methodist Church (UMC) located at 211 Porter Street, we begin this season with an Ash Wednesday service on March 6, 2019 beginning at 6:00 p.m. in the church sanctuary. Our service this year will focus on dust, ashes and breath, which will incorporate all age levels in our church. Please join together with us on Ash Wednesday as the recipients of God’s grace and enjoy scripture enactment along with scripture reflection, hymns, praise and prayers. Come and expect to be moved by the breath of the Holy Spirit. Everyone is welcome. Additional information regarding our Ash Wednesday service can be obtained by contacting the church office at Center First UMC (936) 598-2707 or visiting www.fumccentertx.org. The Jackson Missionary Baptist Church will have a revival with Bro. Steve Brady and family will begin on Sunday, March 3, 2019 at 1o a.m. and will continue Sunday through Wednesday at 6:30 p.m. Every one is invited to attend. They are located on HWY 7 East in Joaquin, Texas. Abundant Love Ministries will be having a huge garage sale. They will also have gumbo. This will all be going on Saturday March 2, 2019 starting at 7:30 a.m. They are located at 1218 Shelbyville St. in Center, Texas. 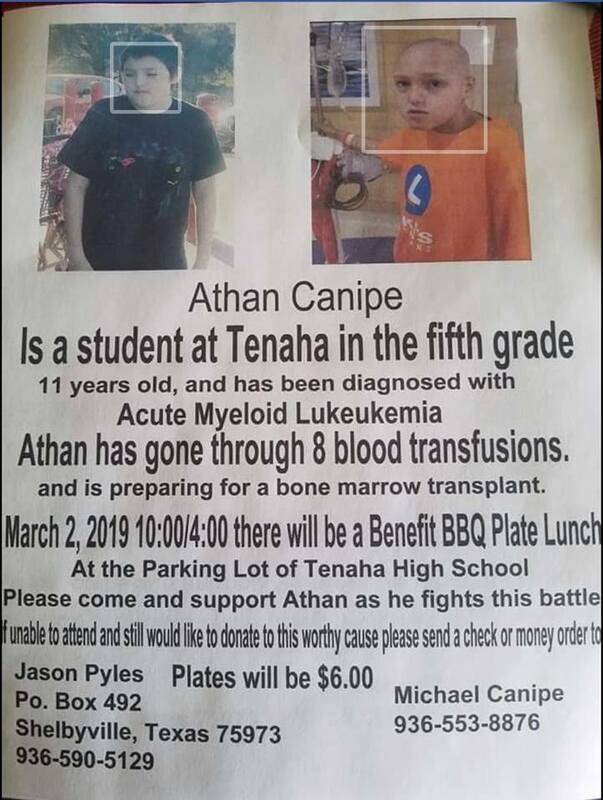 Benefit Fundraiser for Athan Canipe this coming Saturday, March 2, 2019, at the Tenaha ISD Parking lot from 10 a.m. - 4 p.m. BBQ plates will be $6 each. For more information call 936-553-8876. Have you ever wondered how to find your roots? Are you just starting your family tree? 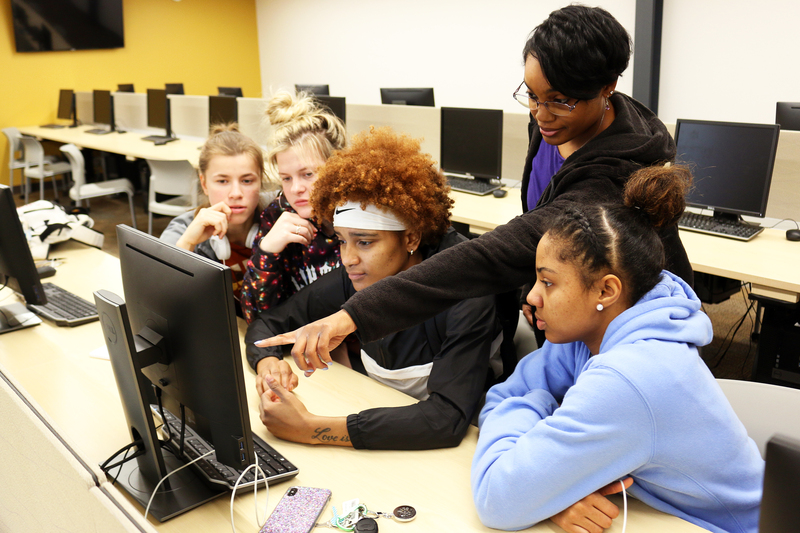 If so, join us at the Fannie Brown Booth Library in Center, on Tuesday, February 26th, at 1:00 p.m. Members of the William Carroll Crawford Chapter of the Daughters of the Republic of Texas will conduct a hands-on workshop to help you begin or continue your journey. Bring your questions, your goals and a little of your afternoon. If you use a laptop for your research, bring it. The Library has WiFi. The mission of the DRT is to honor the memory and spirit of our ancestors. Before we can honor them, we have to find them. Let's start searching. For more information, call the Library at 936-598-5522. Black History Program to be held on Sunday, Feb. 24, 2019, at 3 p.m. at the Mt. Zion CME Church. 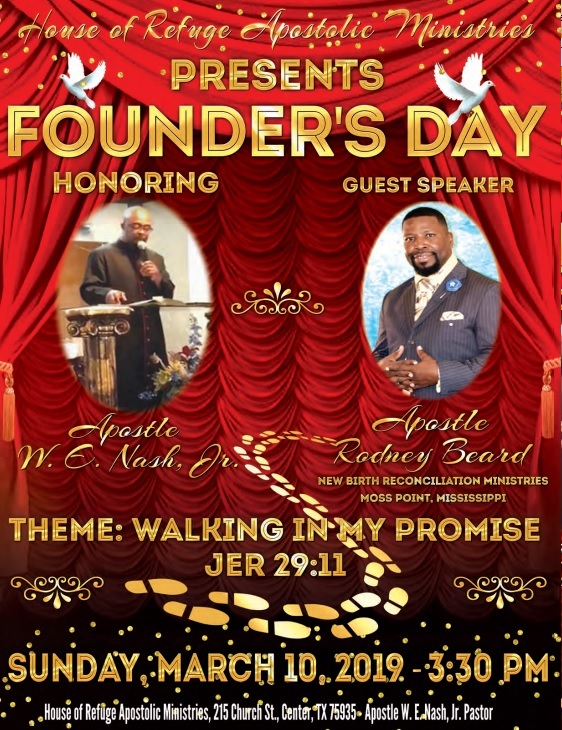 Special guests are Brenda Wimberly and Jonathan Fountain of Shreveport, LA, Alex Cloudy, Jalen Hubbard, Jeremy Small, Christy Byndom, and others. Center, Texas – February 18 – The First United Methodist Church (UMC) of Center announces the winners of their inaugural Soup and Chili Cook-off competition held Sun., Feb. 17 with proceeds benefiting the First UMC Mission and Outreach Committee annual projects. The First UMC Missions and Outreach Committee members extend their appreciation and gratitude to the participants entering the cook-off competition and to the congregation and community for supporting their fundraiser. Sabine County Beekeepers will meet March 4th at 6:30 p.m .at Sabine County Chamber of Commerce (125 N. Texas Street on the square in downtown Hemphill). We will start meeting the first Monday of every month to discuss all aspects of beekeeping. If you are interested in finding out what we are all about please stop by. We have no officers and no dues. For more info call James 409-625-4787. 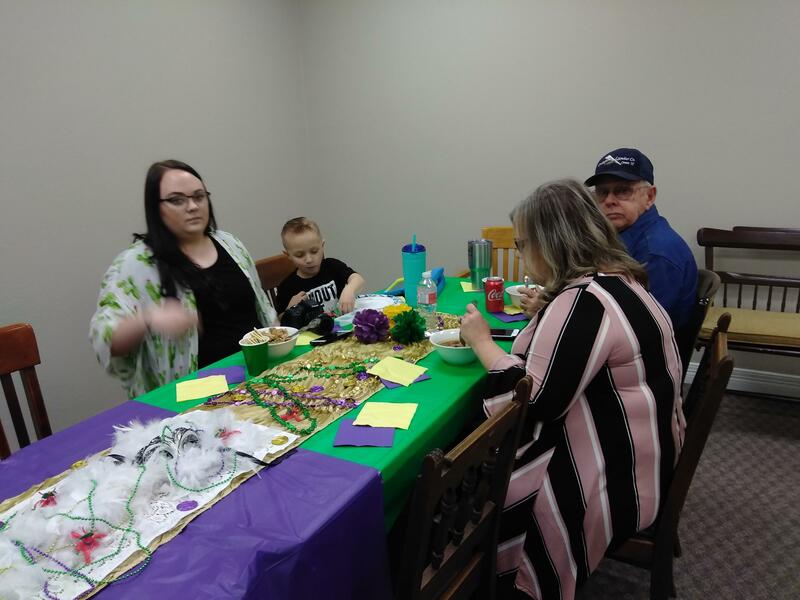 On Feb. 20, 2019, at 2 p.m. Mrs. Vickie Martin gave a presentation to the Shelby County Historical Society at the Shelby County Museum about the history of Shelbyville, Texas. The meeting was well attended with, a full house. Benefit for Dianne Livingston - rescheduled to Friday, March 1, 2019. Several years ago, Dianne was diagnosed with Lymphoma (Cancer). Treatments went well and the cancer went into remission. Dianne also has scoliosis. In January of 2019 Dianne was sent by a doctor to Houston for emergency surgery on her back. A tumor had grown and had her spine bent so badly that the spine cracked. If surgery was not done Dianne would be paralyzed. The Lymphoma had spread and the back doctor had to release Dianne from the back surgery before her doctor could begin treatments on the Cancer. There have been many complications and expenses. Dianne is a member of Providence Missionary Baptist church. We are holding a BAKE SALE on the parking lot of Napa on Friday, March 1, 2019 from 9:00 – 2:00. BENEFITS AND RESALE will be taking donations and selling those donations for Dianne Thursday, Friday and Saturday. March 1, 2. Benefits and Resale for area medical expenses is located on Hwy 96N. From Center to Tenaha, one mile on the left. All donations from the Bake sale and all sales from the items donated for Dianne will go to Dianne to help with expenses. Contact Regina Danley and Catherine Livingston at (936) 332-0060; FB and/or Text. The Annual Health and Fitness Fair is just a few weeks away, so mark your calendar.!! The Annual Health and Fitness Fair,Presented by Cline Family Medicine will be held on Thursday, March 21 at the Windham Civic Center from 9:00am until 2:30. The Event is hosted by the Shelby County Chamber of Commerce in partnership with Texas A&M Agri-Life Extension Services. This year’s theme is “Path to Plate”. Many people do not realize the importance and relationship of what we eat and the affect on our overall health. Vendors will highlight this connection and how many chronic and deadly diseases can be prevented through healthy eating. 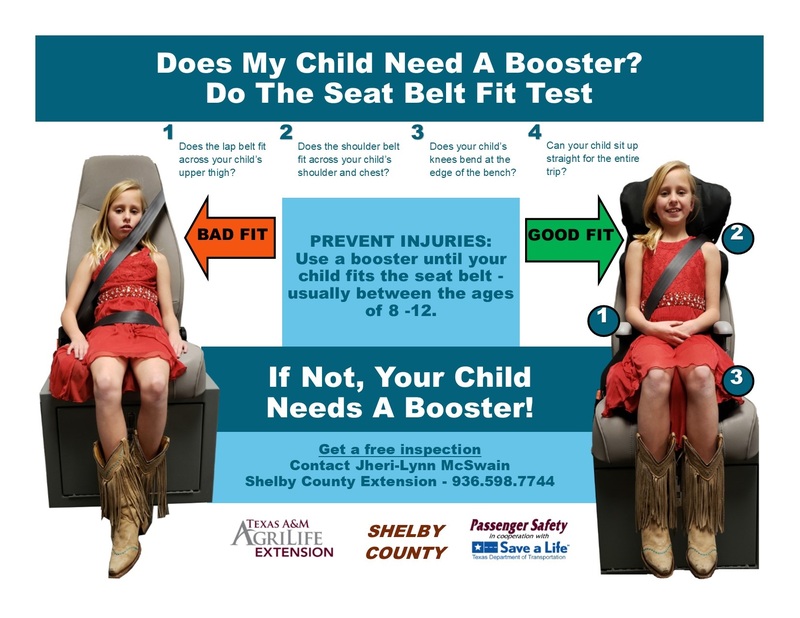 The purpose and goal of the Shelby County Chamber of Commerce Healthcare Committee and the Health and Fitness Fair is to educate Shelby County and the surrounding areas about health care resources available in the area and about their personal health. There will be a variety of health screenings available including glucose, cholesterol, bone density, spinal screenings, heart awareness, diabetes information, allergy testing information and vision. Two mobile mammogram units will be onsite for mammograms. 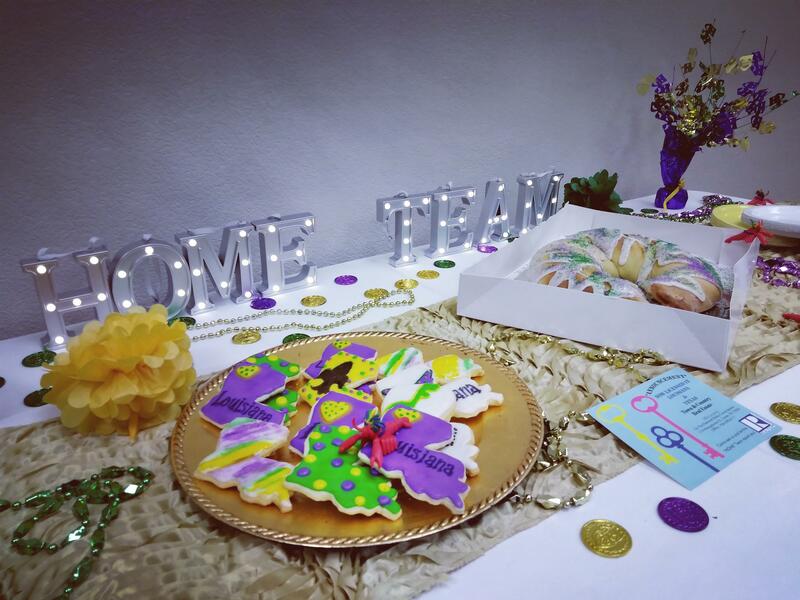 Thank you to Trinity Mother Frances and UT Health East Texas. All mammogram appointments must be made prior to March 13 by calling the Agri-Life Extension Offices at 936-598-7744. There is a charge for the mammograms and most health insurance is accepted. Gulf Coast Regional Blood Center will be on site with a blood mobile taking donations. To sign up to donate please contact Shelby County Chamber of Commerce at 936-598-3682. Gold Sponsors for this year’s event are Focused Care of Center, Hope Community Medicine and Nacogdoches Medical Center. Tired at the end of your workday, need to find a way to save on your grocery budget, want to put a delicious hot and healthy meal on the dinner table? If you answered “yes” to any of these questions, then the Freezer Pleaser Meal Prep Club workshop is for you! Join other like-minded people to learn and prep 10 to 20 freezer meals on monthly basis. 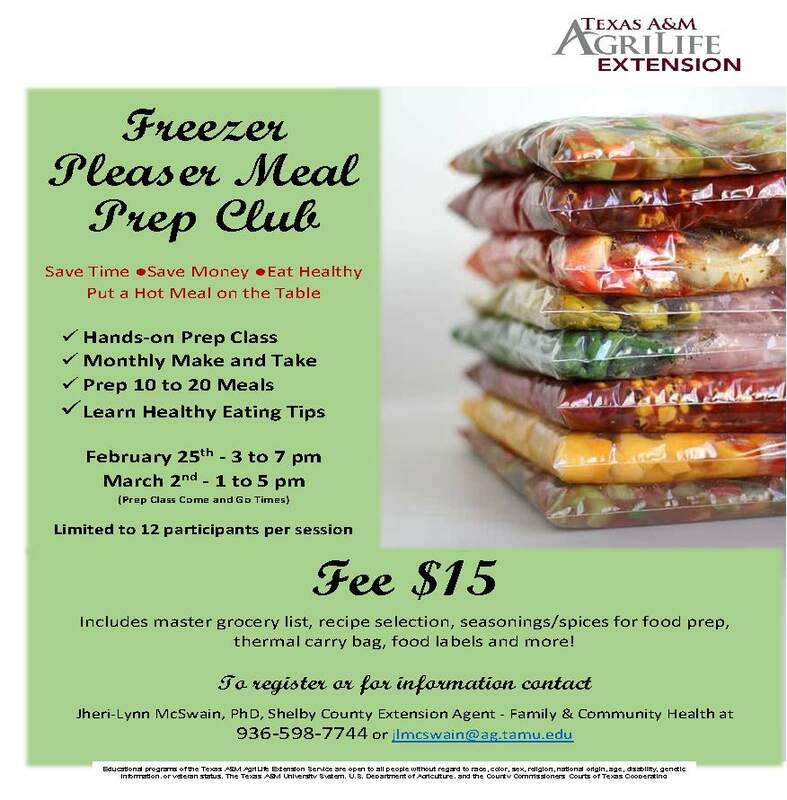 Texas A&M AgriLife Extension Shelby County will be hosting the first monthly meal prep classes on Monday, February 25th from 3 to 7 pm and Saturday, March 2nd from 1 to 5 pm at the Extension office, 266 Nacogdoches Street, Center, TX 75935. These classes are “come and go” sessions so that you can prep, freeze, and eat a healthy meal over the course of time. You may participate in one workshop or both. Additional workshop sessions will be held the last Monday and first Saturday of each month. A selection of recipes will be provided in advance to participants so that you may choose the meals you want to make and take. A master grocery list for food items to purchase will be available for email or pickup. All seasonings/spices will be provided each participant. Printed food meal labels will be provided for your use. Kitchen bowls, prepping items, measuring cups/spoons, food scales, and more will be available for your use. https://www.facebook.com/groups/PineyWoodsPhoto/ for more information or call or text Billie F. Jones, 936-591-2426. We are holding a bake sale on the parking lot of Napa on Friday, February 22, 2019 from 9:00 – 2:00. Benefits and Resale will be taking donations and selling those donations for Dianne on Thursday, Friday and Saturday. February 21, 22, 23. Benefits and Resale for area medical expenses is located on Hwy 96N. From Center to Tenaha, one mile on the left. When George Washington became the first President of the United States in 1789 the Old Stone Fort was already standing in Nacogdoches. Though the original building was demolished in 1902, a replica was erected on the campus of Stephen F. Austin State University in 1936 as a museum. Carolyn Spears, Curator of the Old Stone Fort Museum, will speak to the Timpson Area Genealogical and Heritage Society on the history of the Old Stone Fort and its museum at the monthly meeting of TAGHS on Wednesday, February 20 at 2PM in the Meeting Room of the Timpson Public Library, located on the corner of Austin and Bremond Streets in Timpson. The public is invited. Woodmen Life Chapter 250 will hold their February meeting on Monday, February 18th at 6:00 pm. The meeting will be held at the Shelby County Extension Office located at 266 Nacogdoches Street. We will discuss our 2018 yearly audit and budget planning for 2019. Darrell's BBQ refreshments will be served and all members are invited to come out and attend. Join us for an evening of food, entertainment, and dancing! The Senior Nutrition Site in Center will be hosting a Valentine Banquet from 6 pm until 9 pm on Saturday, February 16th. There will be live music, dancing, and dinner. Deserts are provided by Sassy Reds! Bring your valentine for a fun evening out on the town. There will be a $10 admission. 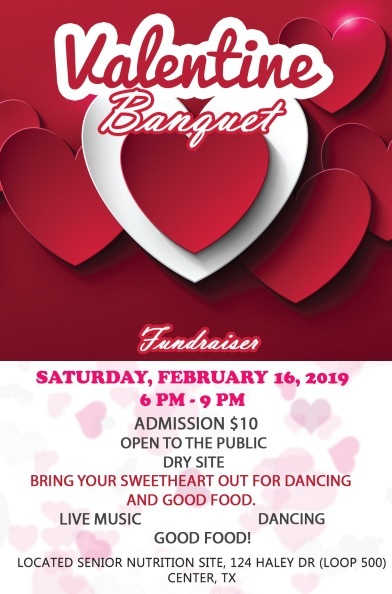 This Valentine Banquet is for everyone of all ages! The Senior Nutrition Site is located on Loop 500, next to Panola College. 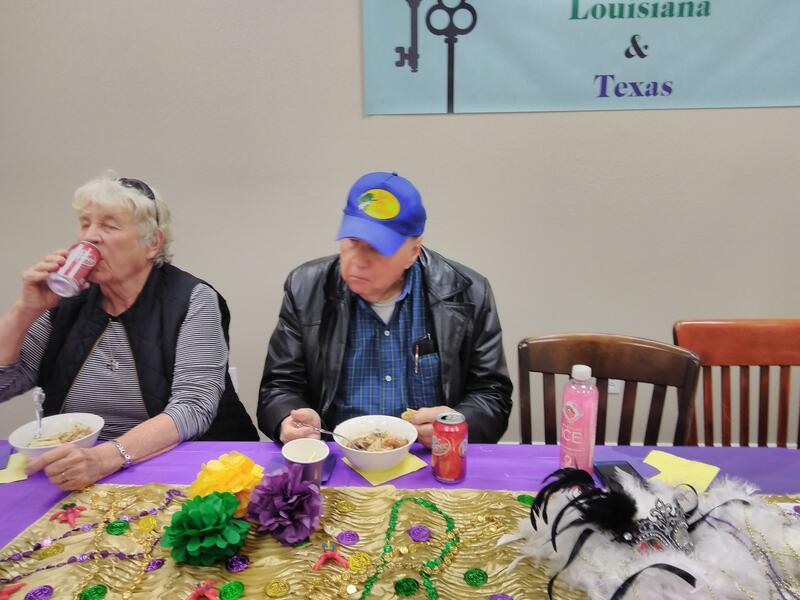 Town and Country located in Center, Texas held a gumbo luncheon on Feb. 13, 2019, in which they announced they will be expanding their business into Lousiana. Center Broadcasting Company attended the luncheon during which Jodi Fountain with Town and County gave a short announcement show in the video below. The Piney Woods Photographic Society will be holding their regular monthly meeting this Saturday,2/16/19, 9 a.m.-12 p.m. at the First United Methodist Church, 211 Porter St., Center,Tx. There will be a workshop on “Using Leading Lines in your Photography “. The monthly Club challenge will feature “Still Life” Photography submitted by members for critique and voting. Looking forward to seeing everyone and visitors are always welcome. Cemetery working will be held on Saturday, Feb. 16, 2019, at 8 a.m. at the East Liberty Cemetery. All that can, please come out and help. For more information call 512-657-5499. Today is the last day!!! Shelby County Outreach will draw the name of the winner Thursday, February 14th and 11:00 am at the Senior Nutrition Site. We need all tickets turned in by Today, February 13th so we can have them ready for the big moment! Reminder: The raffle is for a brand new 10x16 Steel Building made by General Shelters. Tickets are $20 each or 6 for $100. The winner is responsible for moving costs. Come by the Outreach today to get your last-minute tickets! For questions, call us at 598-4990. Tri-County Harvest for Homes Food Pantry will be closed Thursday, February 14 will re-open Thursday, February 21 at 8:30 a.m. 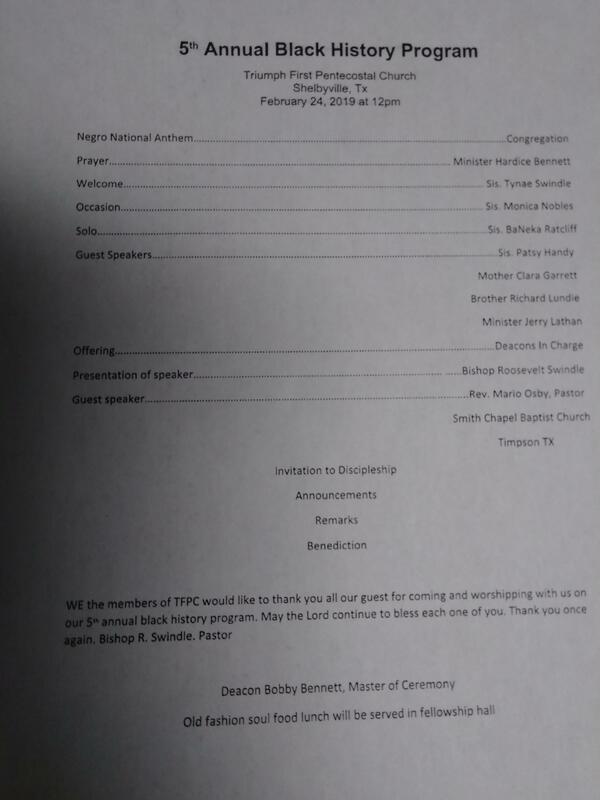 The 5th Annual Black History Program will be held at the Triumph First Pentecostal Church in Shelbyville on February 24th, 2019 at 12 noon. The Shelby County Outreach Ministries will have the drawing for the steel building this Thursday 2-14-19 at 11 a.m. at the Senior Site in Center, Texas. First Symrna Missionary Baptist Church will have their anniversary service on February 17th, at 2:30 p.m. The special guest speaker will be Scotty Bland. It is LOVE YOUR LIBRARY month at the Fannie Brown Booth Memorial Library in Center. You can support our local library by becoming a Friend of the Library. Denise Merriman with Shelby County Child Advocacy along with Happy Bear presented a program on safety to our Pre-k thru 5th graders on February 7, 2019. We would like to thank them for coming to JISD Elementary. The Mt. Herman Missionary Baptist Church located at 9181 HWY 7 West will be hosting a Chili Luncheon Fundraiser for the West Shelby County Volunteer Fire Department on Saturday, February 16th from 11 a.m. to 2 p.m. or until all sold out. It will include a bowl of chili with crackers, drink and a dessert for $5.00. The CHS UIL Film group submitted 3 entries this year to compete in the 2019 UIL Young Filmmakers Festival. Over 700 films were submitted across the state in different categories. We submitted 1 traditional animation created by Chloe Maldonado and 2 narratives by Blane Agnew and Miriam Almaguer. The James Antioch Community will have their regular monthly meeting on Feb, 16, 2019. We have a Pot Luck meal at 6:30 at the Community Building. President, Robert Gregg wants to finalize some plans for making the facility available for needs in the community. I hope we have some nice weather so everyone can come. 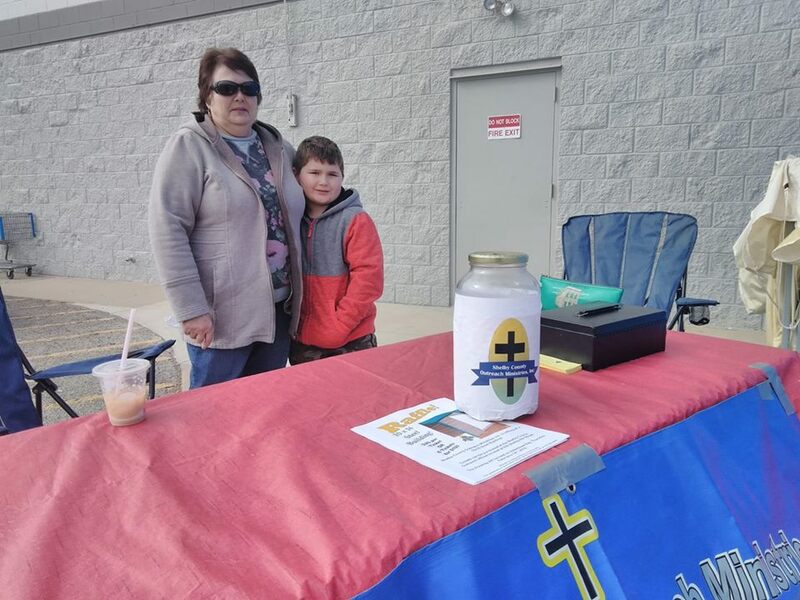 Shelby County Outreach Ministries, Inc. will be set up in front of Wal-Mart today and tomorrow selling raffle tickets for a 10x16 steel building. The tickets are $20 a piece or 6 for $100. The drawing will be held on Valentines Day, 2/14/19. Come get your tickets today before it's too late. For details, call the Outreach at 598-4990. The new ownership of Holiday Nursing and Rehabilitation invites the community to join them for their Grand Reopening on Tuesday, Feb. 12, 2019, from 4 p.m. - 6 p.m. Come visit their newly renovated facility to enjoy delicious BBQ, along with door prizes and a raffle benefiting their residents' activities program. They will also have a special flag and wall of heroes dedication recognizing our veterans. The Mt. Zion C.M.E Women's Conference will be held on Saturday, Feb. 9, 2019. They are located at 921 MLK Drive in Center, Texas. The event will take place from 9 a.m. - 12 p.m.